Object photos: © STScI Digitized Sky Survey. All data + times (in CEST) as supplied by Guide 8.0 software. For jumping directly to the object description just click on the number in contents overview. For more background info and cross-referencing, just click on → CrossRef symbol in front of each object description. Eyepiece maglimits have been calculated using the maglimit calculator assuming optimal conditions near zenith im and fst 6.5m. Highlights - according to my subjective opinion - are marked by yellow font colour. So here we go with Grand Galaxy Night II. Moon phase is increasing again already, so we have to speed up for really using these days' opportunity . Only tonight I guess we gonna have enough darkness and time (before moonrise). So during afternoon I'm already asking my local astronomy friends who'd join me for the one hour drive to to the northern tops of the Schwarzwald (altitude roughly 900m, faintest stars can go as deep a 6.5mag there). Finally there are 2 freaks joining in - plus Christian - a former club member in Heidelberg - also independently joins us during the night (bringing his 18inch ATM lowrider Dob and his girl friend, who's has specialized in observing GCs ...). I also improved the Dob's balancing for tonite, just added another small weight at the front to counterbalance the Bighfinder at bit more well, especially at zenith positions. Still, the wind is really bad tonight. The Dob is shaking, especially at higher magnifications it's really embarrassing. However, I can't take off the front baffle, nor the tube wrapper. I out for galaxies, so a maximum of conrast is urgently needed. NGC4490 (easily found near β CVn) pairs up nicely with its neighbour NGC 4485. The galaxy lies pretty close to the MW (Milkyway) at a redshift of 700 km/sec, which means roughly 6 Mpc of distance. I am not so much interested in the galaxy as such, but rather in the type Ib supernova, which was discovered on 03.03.2008 by Koichi Itagaki in NGC 4490: SN2008ax. 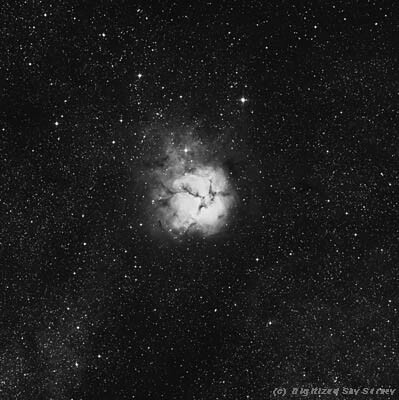 The SN had peaked at 13mag (NGC4490 apparent brightness 10.2mag), and now is reported around 15mag, so I thought it shouild really work out OK trying. Of course it's easy to find such a bright galaxy, but finding the SN turns out to be really tricky it seems. Even while keeping all light off my head (using a special blanket, patent pending :-), I can't sem to get it. I do see the foreground star superimposed on the galaxy, but ther's now way finding the supernova. It sits right inside the bright galaxy disk, so it's drowning in the surrounding galaxy light of 4490. Bad luck - just some days too late I guess... Lateron, Christian Busch states he saw it using his 18inch - he already saw it several times in the recent weeks, so he knows the position very well (he might also have better eyes than me, well, damn him :-). Ok, I'll have a look at this guy finally, but I'm not so much interested in it tonight. Well, it's kind of nice - yes I do see the famous black eye - but you finally rot your adaption to darkness with such stuff, I'm thinking. 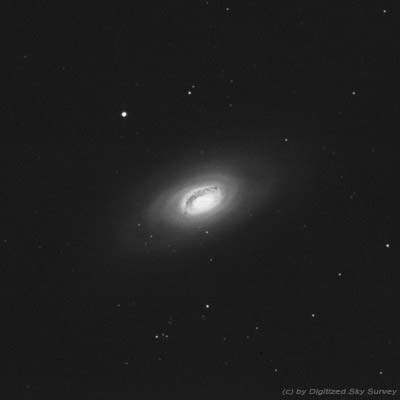 :-) Looking at HST imaging, I guess this can be an interesting galaxy to study, sure. Next time, I'll return with some more background in mind, I suppose. Now for something more interesting to me. Scanning Uranometria I found this nice little (7' diam.) 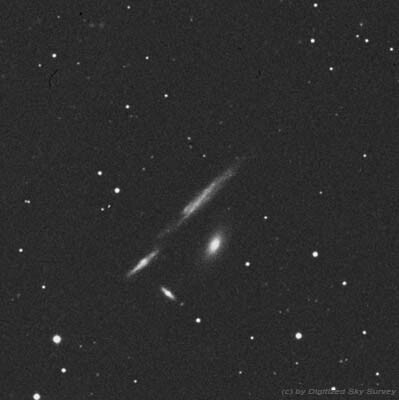 group of 4 galaxies some time ago. It's also located in Coma, the components being NGC 4173, 4169, 4174 und 4175. It's not too hard finding it: just 3° west of γ Comae, galaxies around 13.2 - 14.4mag, pretty bright for my 20" (limiting magnitude of 17mag roughly). All members are disk galaxies, i.e. spirals or S0s of medium luminosity (-18...-20.5mag). The weaker NGC 4173 (a big spiral with low SB in the north) is actually a foreground object, with redshift of 1100 km/sec fitting to Virgo. All others show redshifts of 3800 km/sec, so they do seem to belong together physically. 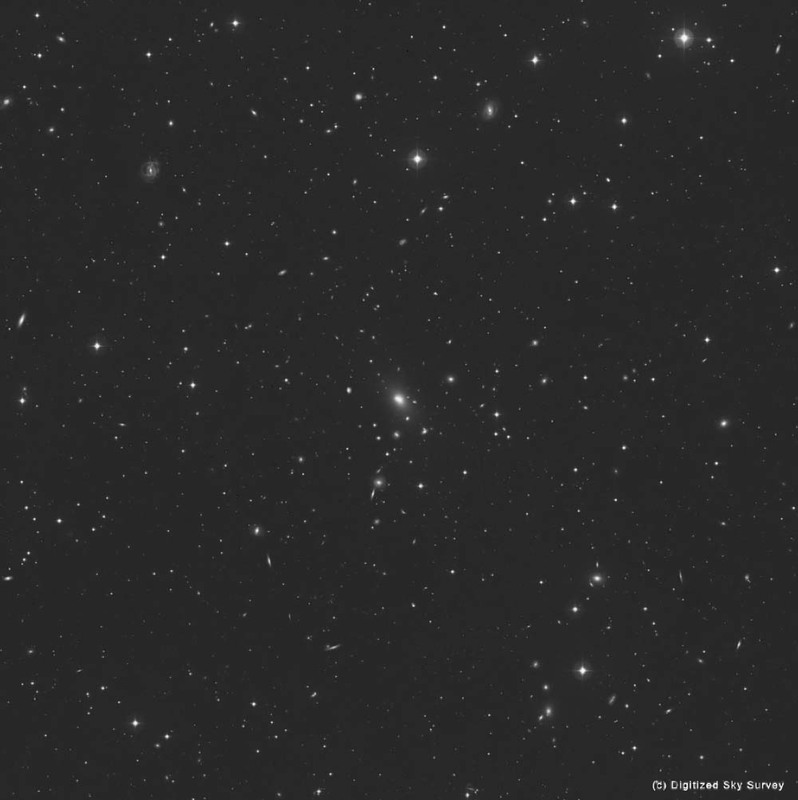 So, 'The Box' is NOT a box, indeed, but a triplet with some foreground field galaxy. All four of them are easily seen in my Dob, but they require pretty high magnifications for optimizing the impression you have at the scope. My 9mm eyepiece with 22' field fits excellently to the 7' diagonal of the group. The galaxies are obviously pretty different: pretty low SB in NGC 4173 (at absolute magnitude of M=-18mag, only, so a LSB (low surface brightness) galaxy anyway (classified Scd). NGC 4169 is bright and obvious (S0, peaked like an early-type E galaxy), 4175 is elongated while 4174 remains rather faint. Some addition in behindsight: as much as redshifts are concerned this group has additional members to it which are located at slightly larger angular distance on the sky. 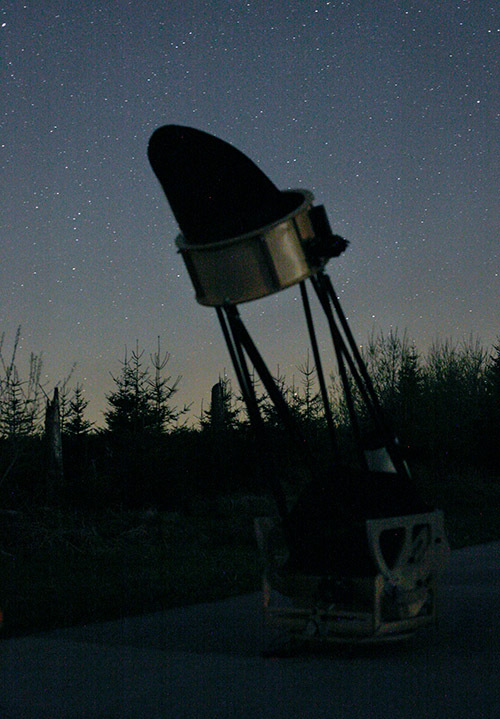 I'm planning to check those out as well, but I'm afraid this gonna happen in next spring's observing season. I'm going to check out the large-scale structure in galaxy distributions in this area thoroughly then, at least hope so. The Siamese Twins NGC 4567/4568 are located right in the middle of the Virgo cluster (1.5° NW of ρ Virginis) - at least when talking about angular position at the sky. Both have comparable reshifts around 2200 km/sec, so physically they belong together, and might well interact gravitationally (or have interacted in the recent past). However, Virgo resides at 1100 km/sec in redshift space, so the twins are located in the background of virgo at roughly twice the distance. My shows both objects (11.7/12.1 mag) pretty easily. You can note the skew angle towards each other and both objects show weak indications of structure. They seem to be spirals. The northern guy appears smaller. 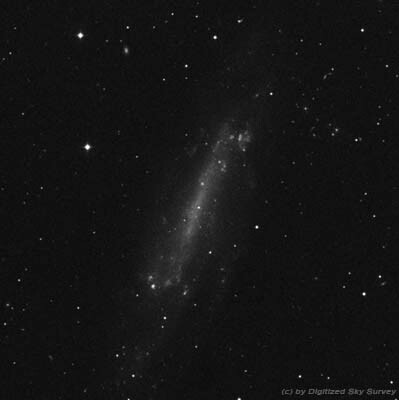 Another 12' off north there is another galaxy, called NGC 4564 - no structure seen here - seems to be an elongated elliptical (E7 oder S0 Galaxie) and so visibly very different from the twins. 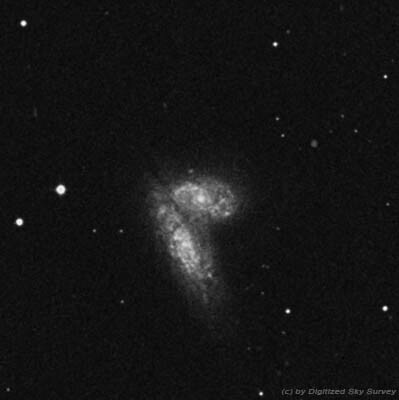 I've been looking at some (merging) prototype galaxy pairs recently, especially at the famous Antennae as reported in Grosse Galaxiennacht I (german sorry, not translated yet). Although the antennae are both famous and bright, they don't seem very rewarding in behindsight. Just the main galaxy bodies to be seen there, no tidal tails. The Mice are considerably fainter (14.4/14.7 mag), still, they are showing much more prominent merging features to the visual observer. My dob reveals a very decent tidal tail at the northern component A galaxy, heading straight away from the galaxy core with a length of roughly 2-3 times the galaxy's diameter (in DSS roughly 100" long). No tail however is seen at component B. Due to their faint magnitude I could not see those objects in my Bigfinder. 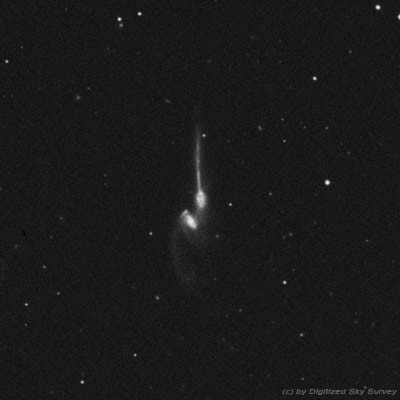 In the dob I need higher magnifications to clearly see them as a pair (at 30" distance from each other). They both have redsifts of 6600 km/sec, putting them a 90 Mpc distance. Qbsolute magnitude range around M=-20.5, so they both seem to be medium luminosity spirals (spirals because you need something to produce the visible tails, I doubt you could see tails made of stars that clearly). 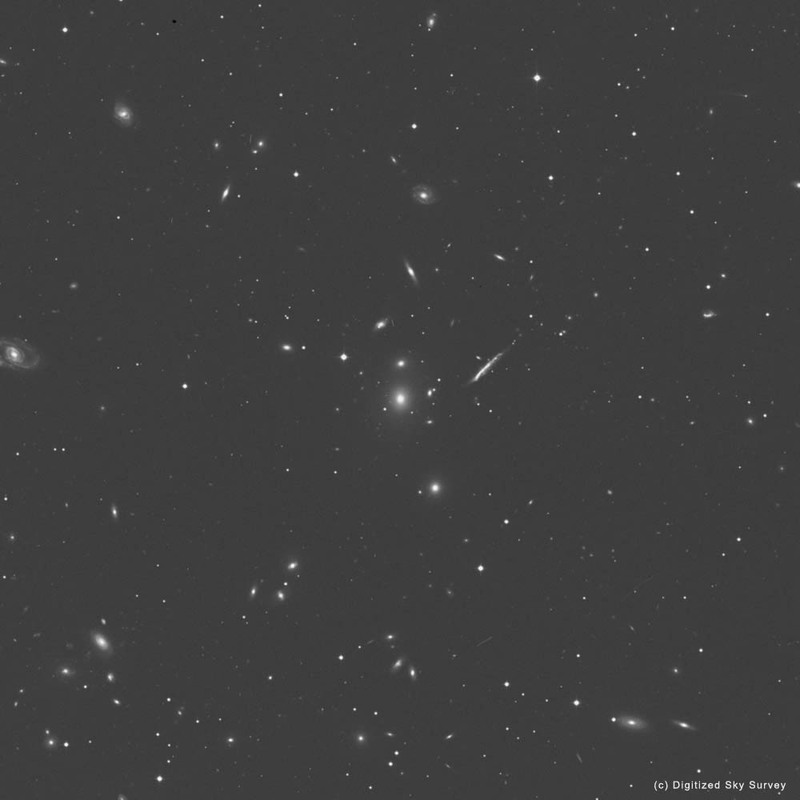 In projection, the objects are separated by 40000 ly, which means 'pretty close' in terms of their disks (disk diameters range typically round 100.000 ly). Well, I'd really say: go for it ! - highly recommended - if you have enough aperture (>12") + good skies for 14-15mag class galaxies. NGC 6166 is a famous BCG (brightest cluster galaxy, 12.9mag) and the dominant object of the cluster Abell 2199, located only 4° NW of M13 in northern Hercules. 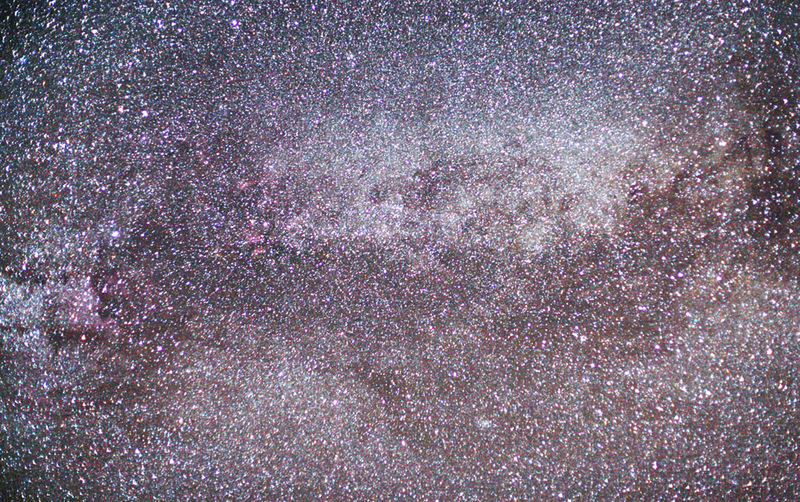 However, it took me a while find the stuff, because the surrounding star field is so poor in significant stars. Most stars are 8-9mag without forming remarkable constellations. It's becoming tedious if you searching and searching and never get there ... Sometimes, well I don't know... Finally and happily, I grabbed 6166 by its sheer brightness and located it by brute force :-) - using the Bigfinder ! Gotcha. Let's be very straight on this: How often do you look at M13 ? I'd say very often, don't you ?! On the other had, let me also ask: How carefully do you observe it ? Well, yes, I simple have a look and check it's still there... Yes it look great but that's it, basically. I personally mostly have a look before astronomical twilight is complete. 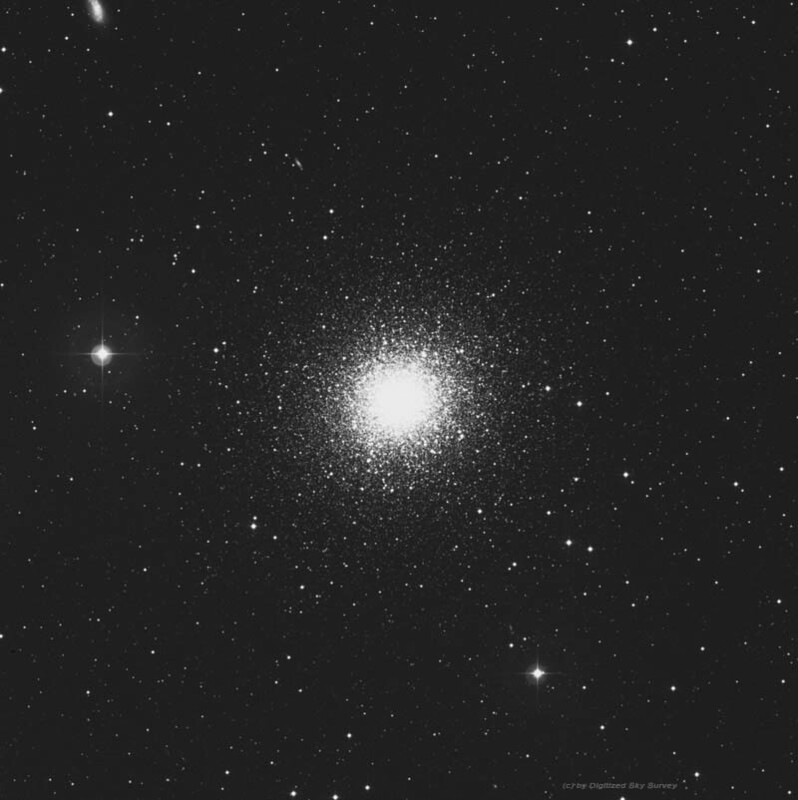 Galaxies don't work yet, so I have a look at M13. Guys with big dobsonians spent their precious time somewhere else, right ?! So it really happened by chance that I had a glimpse at M13 tonight at prime dark time. There's also a small galaxy (NGC 6207) nearby in the background, right ?! As soon as my dob points to M13, NGC 6207 receeds into the background even more than before... M13 almost blows me off my (pretty small, I'm glad !) observing ladder by its sheer size ! - Wowow ! Yeah, I know M13 is a real big GC, but was it ever and really that big ? In my 20mm Nagler (with an optimal 5mm EP) I am really overwhelmed !!! - how big M13 really is !!! Those 7mag stars which frame M13 are located at 30' distance to each other and M13 creates the well-known symmetric triangle with them. The distance from M13 to a star amounts to 17'. 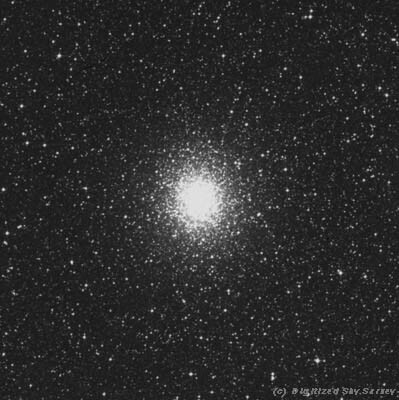 But: still at 2/3 of this this distance (which means at radii of 10'-12' from the GC center) I am seing weak M13 stars now. It's f-a-n-t-a-s-t-i-c ! 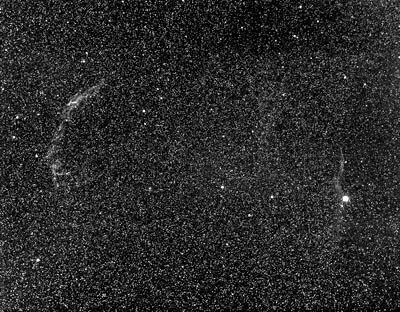 I re-check my own DSLR-image I took with on my 8" Newton just for comparison and I also remember the visual appearance in that telescope: by far less spectacular, but by far smaller !!! The 20" dob view tonight extend considerably futher out than on the picture I took. Seems, it's worth checking standard objects now an then, at optimal conditions. It's definitely not a waste of time. If some object has a radially decreasing brightness profile, it's of course, obvious that object size increases in larger apertures and with better skies. Sure, everyone agrees. Still, this sight was so amazing that I investigated the case a bit further. I had a look at the GC data by Brian Skiff: proceeding deeper from of μ22 (mean SB of 22mag/sq.arcsec) to μ25 (mean SB of 25mag/sq.arcsec), the corresponding diameter of M13 (at these levels) in fact doubles (!) from 10' to 20'. It's interesting to investigate the details of this. M13 = NGC 6205 resides 25.000 ly = 7.700 pc away from us in the spherical halo of our galaxy. Its distance modulus is (m-M) = 14mag, so every object you consider with some absolute Magnitude of x gets dimmed by to x+14 mag, when shifted (from the standard dstance of 10pc) out to M13. Brightest cluster stars in M13 shine at apparent magnitude 11.9mag, corrsponding to M = -2.1mag absolute magnitude (our sun shines at MV = 4.84mag). The well-known Hertzsprung-Russell-Diagramm HRD (which is the distribution of stars of a given luminosity on spectral types) of a globular cluster look very different from open clusters. GCs are very very old, about the oldest objects in our galaxy, several Gyr (billion years). The main sequence (MS) has burned down to pretty faint stars already, i.e. many stars have evolved from MS stars to (red) giants. This can nicely be seen in a CMD = colour-magnitude diagram (which is the observer's analogue to the HRD of theoreticians) of M13 (from: Guarnieri, Bragaglia & Fusi-Pecci (1993), A&AS 102, 397): it reveals a well-populated RGB (red giant branch, skewed line towards upper right, red + bright stars) and AGB (asymptotic giant branch, brightest giants at upper limits of the RGB). But there's also an HB (horizontal branch, stars rather blue and of medium luminosity, clumping at the left around >15mag). Looking at page 400 you'll see: only if you reach down to the magnitude limits of the 20" dob (17mag), (i) you can really detect the HB population, and (ii) you scan the RGB much deeper down, where lots of stars are populating CMD-space. With my 20" I can detect stars down to absolute magnitude MV<3mag (stars 1.8mag = factor of 5x more luminous than our sun). If you run a small to medium-sized scope, e.g. 8", you gonna see stars down to m=15mag, which are only the most luminous AGB/RGB stars, while the HB is too deep for you and you simply miss this population completely. And then there's also number statistics: in 8" you can see only very few stars <15mag on the outskirts of M13, so I tend to take this for the outer borders of M13. In a 20" machine, we are seeing a massive population of faint HB und RGB stars. Only when those stars get rare farther out, we hit the visual signpost saying 'you're leaving M13 now'. Scorpius and Sagittarius are rising tn the south-east. I am zapping around over there a bit, because I'm getting too tired for hunting galaxy clusters now. Just close to M4 near Antares = α Scorpii I run into a small GC - ames M19 - just 7° east of M4 - nothing unusual of course, as the whole area is crowded by globulars, so close to the galactic center. The spatial distribution of GCs in our galaxy is spherical, and their density goes up towards the galactic center (so it's bulge-like in morphology, but also in kinematics, with many radial orbits etc). M19 is not a prominent GC, just 6.8 mag. However, one thing gets obvious immediately in my dob: it's notably elongated in noth-south direction. This is not a common feature for GCs, they tend to be pretty spherical, well 'globular' right ?! Only large monsters show flattening, like e.g. ω Cen. The DSS image below does not show th effect well, so I guess that only the brightest population of RGB stars in M19 has some flattened distribution, which is remarkable, too. With visual observing the flattening is very obvious though, like an E5 galaxy, I'd say. 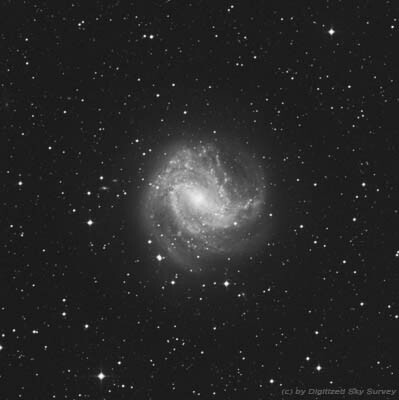 M19 is also interesting because it's so close to the MW center, SEDS states that the distance is only 5200 ly (to MW center), while our distance to SgrA* is roughly 30.000 ly. It's been a long day, and so was the night. I begin to have trouble keeping myself upright now. So let's go for a little walk through the MW structures (halfway up in the east now) that stick out so nicely. Scorpius now goes through culmination, Sagittarius can be seen very well allready. 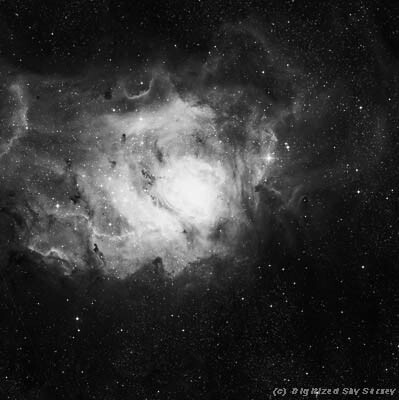 I have a look at the Lagoon nebula which I can se by naked eye already (using an UHC filter due to the close horizon). Just next to it very nicely seen: Trifid, with a three-fold dark nebula running across plus the reflection nebula in the north. I really love my 6" f/5 Bigfinder for showing so nice oveviews with the Nagler 31mm (at 24x magnification and a 3.4° field). 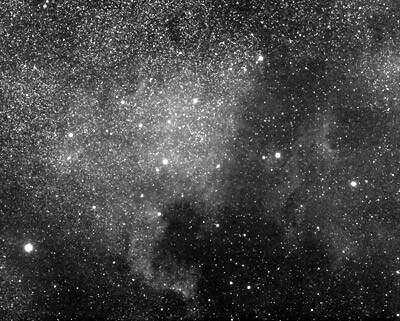 Zapping up to one of my favourites: Barnard's dark nebula B142 in Aquila, a mere 1° westl of γ Aquilae (one of the two companions of Altair). 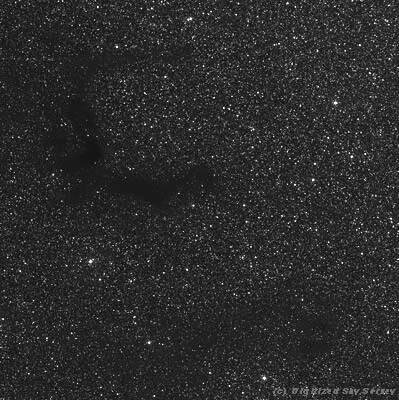 It's fantastic to see those dark clouds like holes or gaps in the sky - great objects for the bigfinder again (checkout the DSLR image below and find B142 in it :-) ! Of course, we can't avoid passing by at Northamerica, Pelican and Cirrus/Veil with its parts in the west, east plus Triangular Wisp NGC 6992/6995/6960 (all seen best in OIII) - like last night. On the Veil, I have an additional look through the dob again with 20mm/OIII, mainly on the northern part of the eastern wing: looks like Dali painted like crazy on black paper with white chalk. Absolutely crazy ! OK, that's it, I really had 2 excellent nights of fantastic springtime galaxy observing. 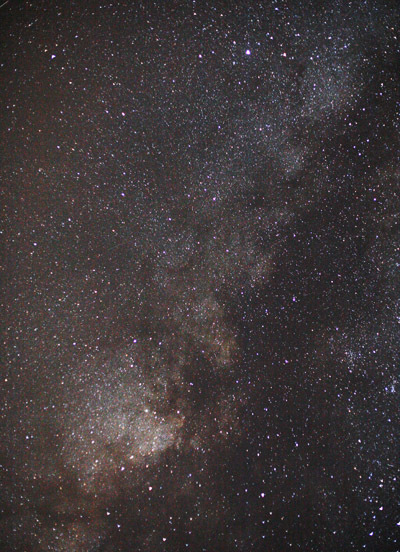 The Milkyway is rising in the east ...(Northamerica + Pelican, with Deneb = α Cygni above (N is left, E is down).